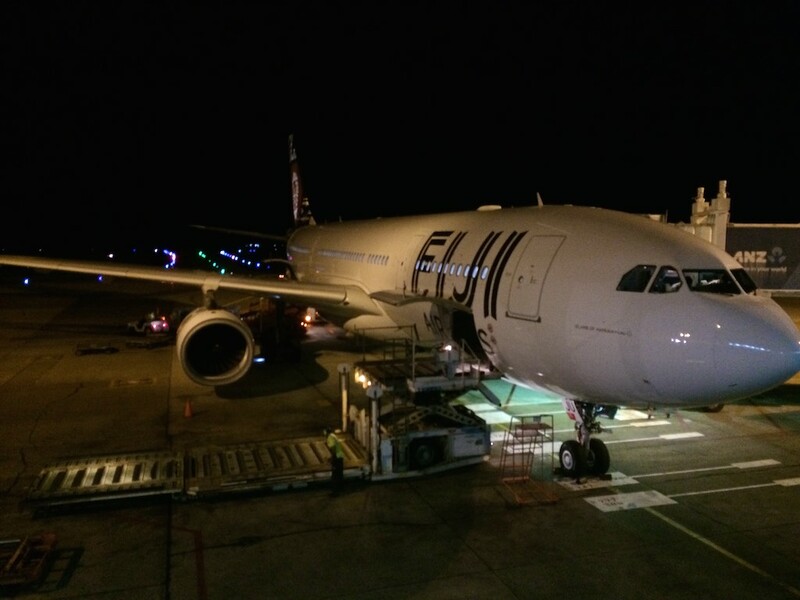 Earlier this year my family decided to spend around 10 days in Fiji – with the majority of the break booked using points. 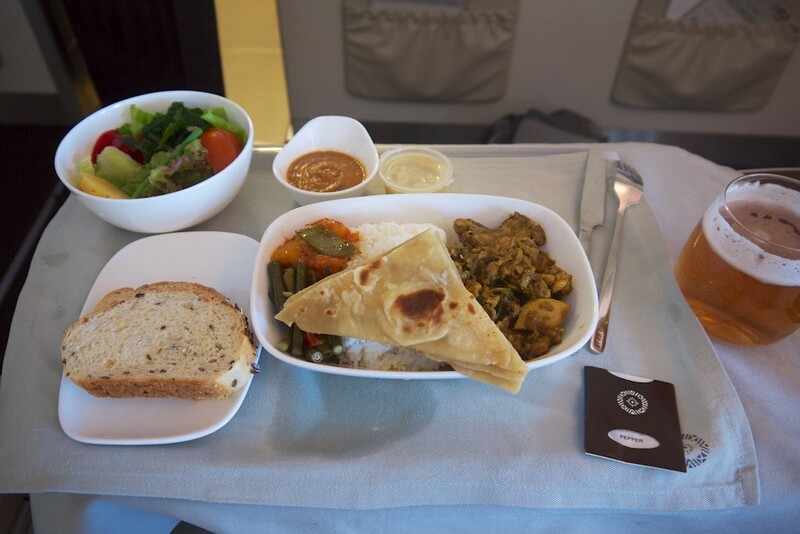 We flew over in Fiji Airways Business Class, stayed at the Sheraton Villas on Denarau for the first half of the break, and the InterContinental Fiji for the second. For this trip our little group is two adults, a 3 year old and 9 month old – meaning I only had to find 2 or 3 seats using points, as Abby, our 9 month old, can travel as an infant. 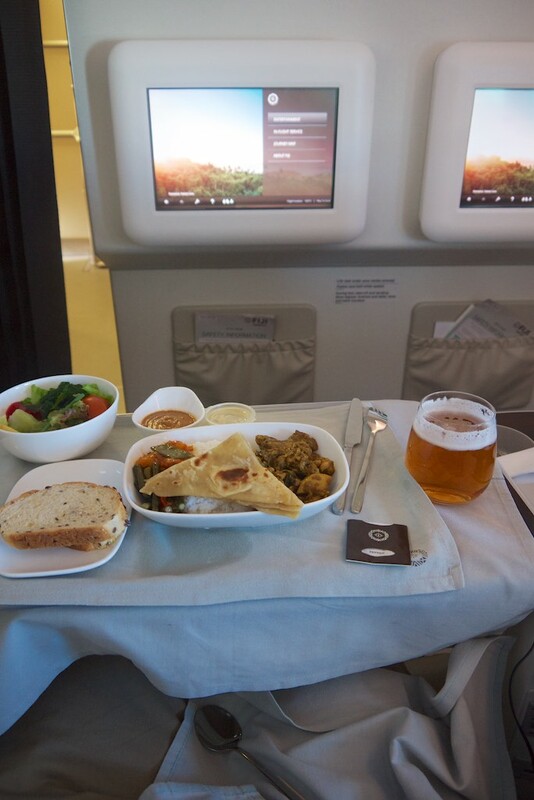 I really tried to book everything using points, so read on for how we managed to bring in a pretty deluxe holiday for not so deluxe money, and for my thoughts on Fiji Airways A330 Business Class. 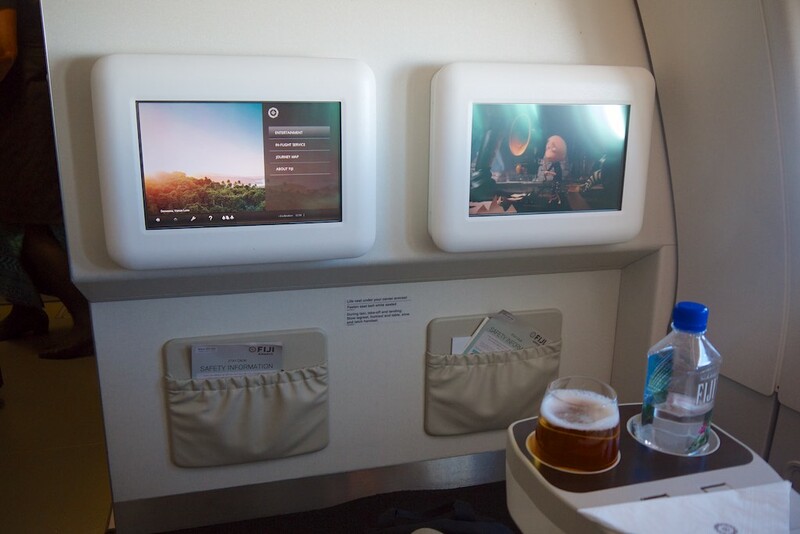 Since Air Pacific rebranded themselves (back) to Fiji Airways last year, and took delivery of their A330 fleet, I’ve been keen to try them out. For this flight, I redeemed 30,000 American Airlines AAdvantage miles for both my partner and eldest daughter – compared to 36,000 Qantas Points one way, this definitely isn’t the best value redemption but I didn’t have the Qantas Points needed in my account at that point in time to use them. 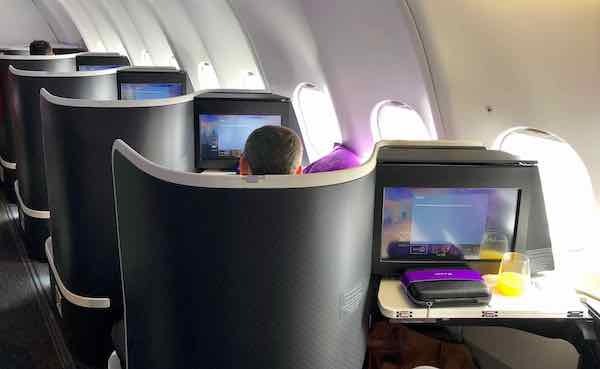 I would usually value Advantage miles at 2x that of Qantas Points, so I wouldn’t recommend taking this route – but I had the miles in my account and a use for them. 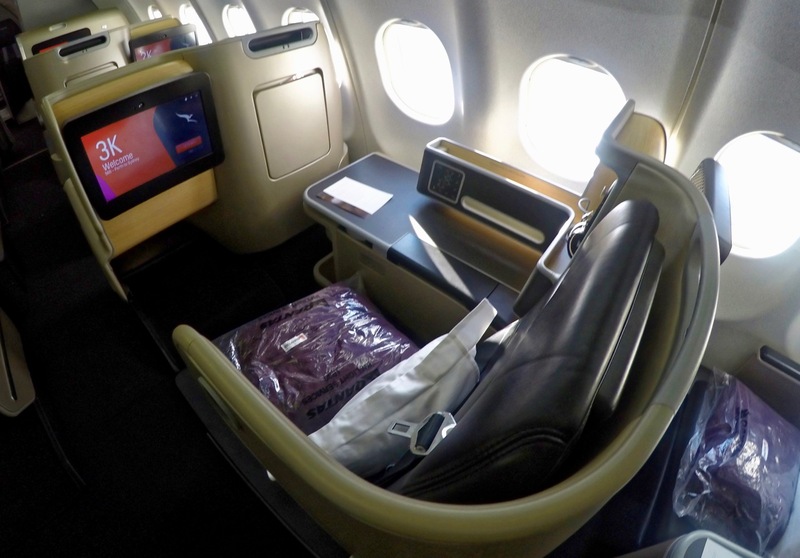 For myself, I used up some existing Qantas flight credit and booked myself on a paid Business Class fare for around $750, meaning I’d earn points and 80 status credits to help me toward renewing status. Our youngest, travelling on an infant fare, was ticketed with me. 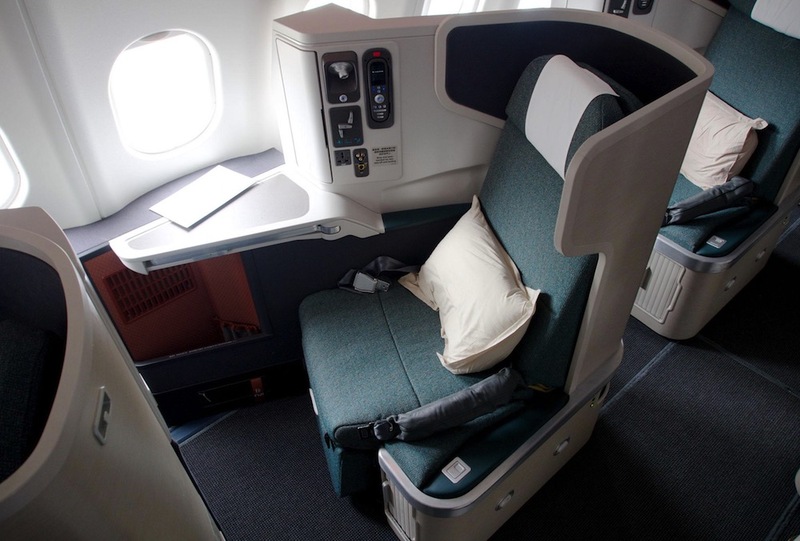 All up, the taxes came in at around $400 for one adult, one child and one infant on top of my fare, and finding the two award seats in Business Class that we needed on this route was relatively straightforward. A few weeks before taking this trip, I’d had my odd adventure to Oslo, via London, which tipped me over the edge to Qantas Platinum. 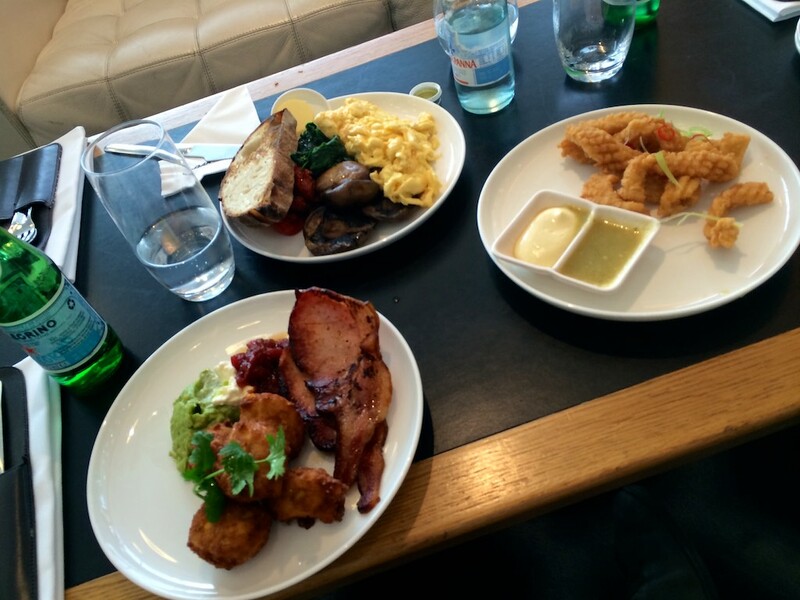 I was excited to hang out in the Qantas First Lounge in Sydney for the first time in a while – and luckily this was possible as I’d booked myself on a Qantas coded ticket. If I’d been travelling on a Fiji Airways ticket, there’s no First Lounge access for Qantas Platinums in Sydney or Melbourne. After brunch in the lounge, we moved off to board and get settled into half of the first row of the plane. 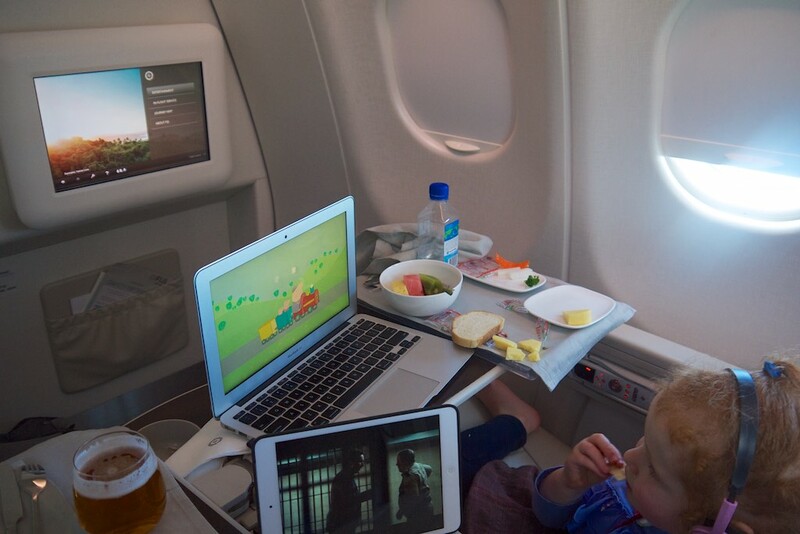 We put the adults in the two aisle seats, and our three year old in the window. The bassinet location is on the middle bulkhead, but we didn’t use it for this flight. 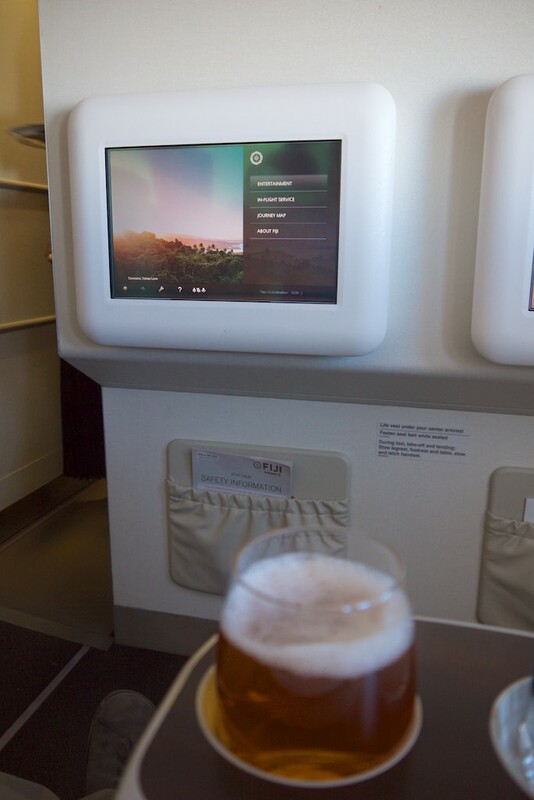 The service was pretty friendly, but nothing special, and we settled down with a bit of in-flight entertainment after take-off to keep us amused for the 3.5 hour flight. I also commandeered a Fiji Gold beer – the first of a few in this week – to relax into the break. 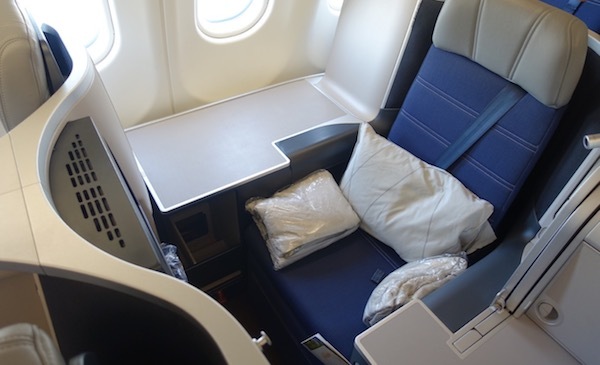 The Business Class seating and amenities were nicely designed, as I’d expected, with pillows and blanket available to get comfortable. The cabin itself is a light brown / beige colour, which I can’t imagine will age well, but looked great for the time being. After around an hour, the crew served up dinner. I’ve included both the drinks and food menus below, but I ended up not getting my first choice as a main, which was not so great. Such is life I guess. After the meal, Zoe (our 3 year old) and I tried to get stuck back into the entertainment, but we didn’t find much beyond the first few options we had already viewed – so out came the laptop and iPad. Finally, we landed on time in Nadi and headed off through customs and immigration to find our transfer to the Sheraton Denarau. All up, this was an unremarkable flight. 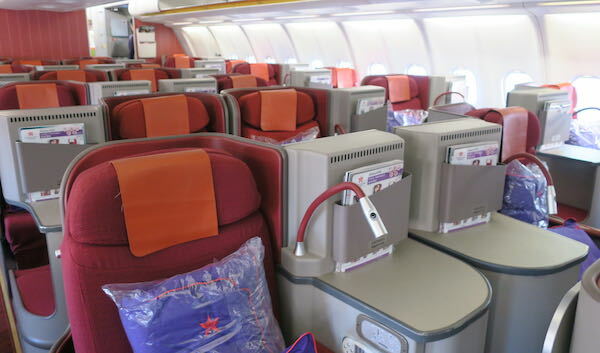 I had previously travelled on one of Air Pacific’s ageing 747’s, and this thankfully was a world apart – their new A330s are slick and comfortable in Business, and regardless of our class of travel, I was grateful to be travelling on a wide body – we came home on a Virgin Australia 737 and it was hellish by comparison, in terms of personal space. 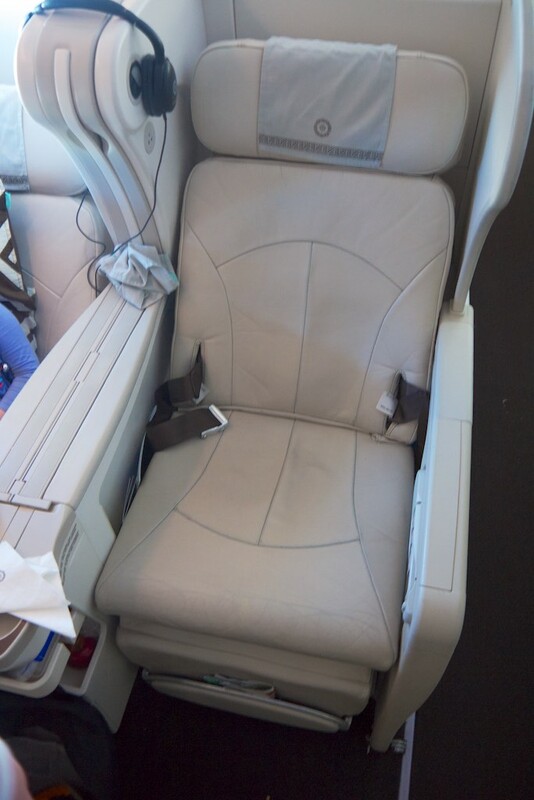 The Fiji Airways Business Class seat was comfortable enough, but is angled flat so I wouldn’t fancy my chances of sleeping amazingly well on a long-haul overnight flight. The service was acceptable – friendly, and nothing memorable. Having said that, the ground crew did go to great efforts to find a small toy that was lost in a seat crevice when we landed – to great success as well. So top marks there, but inflight, it was neither great nor poor. 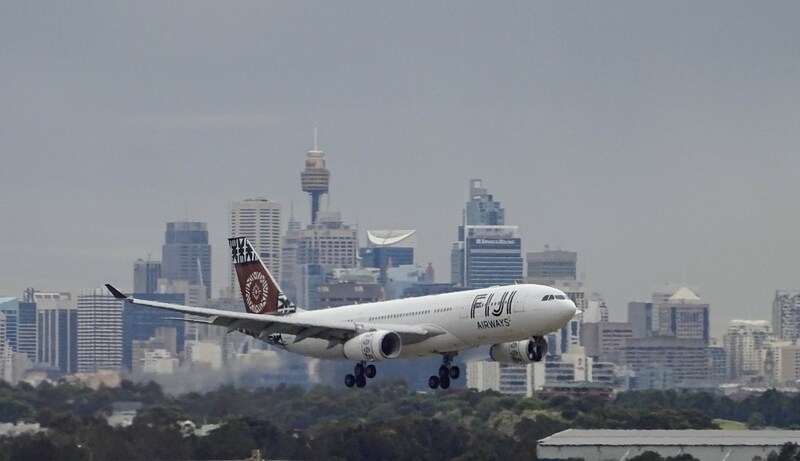 So Fiji Airways was a great way to get to Fiji from Sydney – the A330-ness of the whole flight really made it so, with the much larger cabin being far more family friendly. 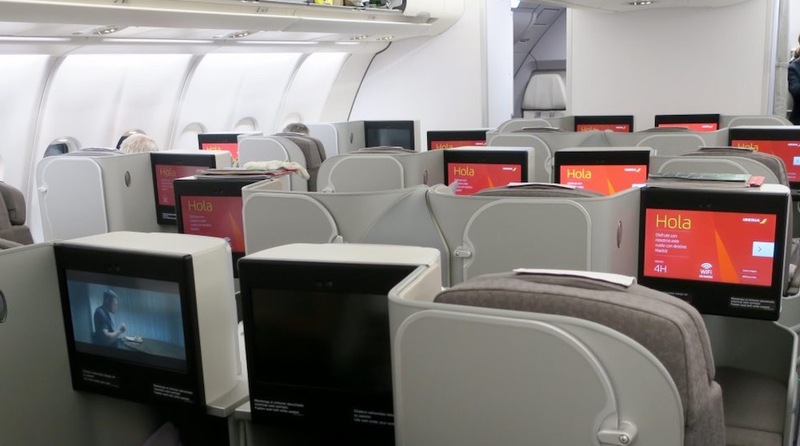 As a result, Fiji Airways A330 Business Class service is probably the best way to get to and from Australia and Fiji, and tt would be well worth seeking out an A330 specific flight over the smaller options from Fiji Airways, Jetstar or Virgin, just for this. I know I’m very late to this article, but I’d love to hear more about research and booking – as I’m wondering if this might be a viable option for a flight to LA for my family using AA points. How did you find the flights? Using Qantas’s site? And how did you book? By ringing AA? Bugger!!! Guess I should look into Alaska Milleage Plan instead. Thanks. 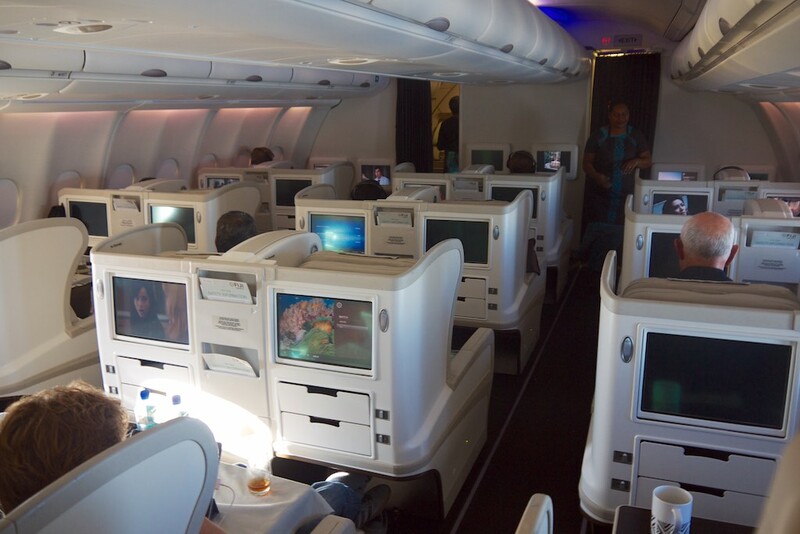 Hi Keith, you’ve mentioned 36,000 Qantas points for a return Sydney – Nadi business class flight? Is this a saver fare? Tried plucking in a date for this but came out return 100,000. That’s a one way cost – I double checked it in the Qantas Points calculator, and yes, 36k points one way as a Qantas partner booking. 100k return probably includes taxes being paid with points. 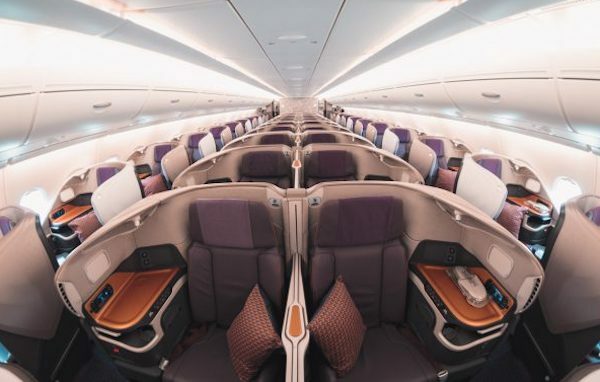 Can you use DividendMiles to book a return Melb-Nadi business class flight? If so, how much miles required? Saw the award chart (South Pacific-South Pacific), 30K return seems a lil low. Might not be looking at the right column/ row!!! 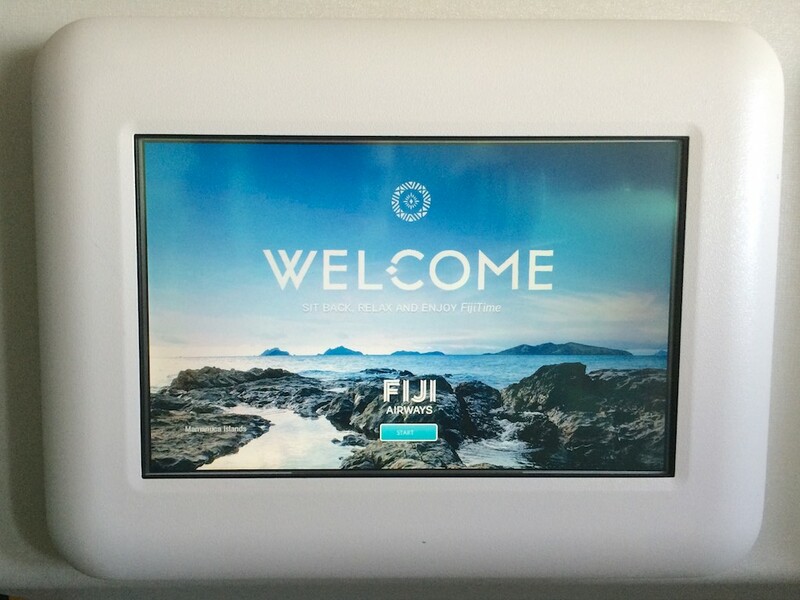 You can’t, Fiji Airways is not a USDM partner. If you paid for your resort stay with Starwood points, are you going to post about that? I would like some for an NYC stay, but the Amex Membership Rewards transfer rate is poor. I’d love to know another way to acquire them in Australia! I will be writing up our Sheraton stay, and yes, I did book it using points. And there are no easy ways to acquire them here 🙁 – I just saved hard in Membership Rewards.